If you have already received the refuge vow before, in all four traditions it is the same. The Three Jewels are always the same. So if you have received refuge before, you do not have to receive it again. But you may if you wish. But even if you have received it before, it is good to hear the introduction on the meaning of the vow again. When we take refuge, it is like a purifying and restoring ceremony. We purify our transgressions, broken commitments, negative emotions, and we restore our bodhicitta. Therefore it is good to receive the refuge vow again. Some people take refuge because they understand with their wisdom that samsara has the nature of suffering, and they want to become free from that suffering. They know they can only become free if they rely on the Three Jewels. There are others who take refuge in the Three Jewels because they want to help other sentient beings. They know that alone they are not strong and they must therefore rely on the Three Jewels. So we take refuge in the Three Jewels with such a mind of wisdom and compassion. To have those is a great merit. When we take refuge, we seek a protection from the vast ocean of suffering. Everyone wishes to be happy and no one wants to suffer. That, we all share in common. There are various systems in this world to protect us from suffering. The mundane systems only concern this life. Sometimes they can protect and sometimes they cannot. For this reason, many religions have appeared in this world. This is also the intention of the Buddha’s teachings. The word “Jewel” (Tibetan: Kon Chog) means “rare and supreme”. The most supreme source of protection is the Three Jewels. Also, the Three Jewels are rare because, unless we possess great merit and wisdom, we will not even have the wish to take refuge. You have the wish to receive refuge. That is a great merit and a sign that you have already connected with the Three Jewels in a past lifetime. There are not many who have this kind of merit and wisdom. Actually, all sentient beings possess Buddha Nature. The difference between Buddhas and sentient beings is that the Buddhas are like a vast ocean, and sentient beings are like blocks of ice on that ocean. Sentient beings grasp at the duality of self and others, and therefore become like ice-blocks and wander in the six realms of samsara, suffering incredibly. And of all these different kinds of birth, even though we may obtain the precious human body, if we still do not meet with Dharma, we still will not know how to tolerate suffering in this life and how to create happiness in future lives. We must understand that happiness comes from causes. The cause of our happiness that we are experiencing right now is loving kindness and compassion. Through taking refuge, we understand this. We must also understand that our present suffering also has a cause. The causes are afflictive emotions. So when we take refuge, we learn about the need to abandon the causes, the afflictive emotions. In the beginning we take refuge in the outer sources of refuge. 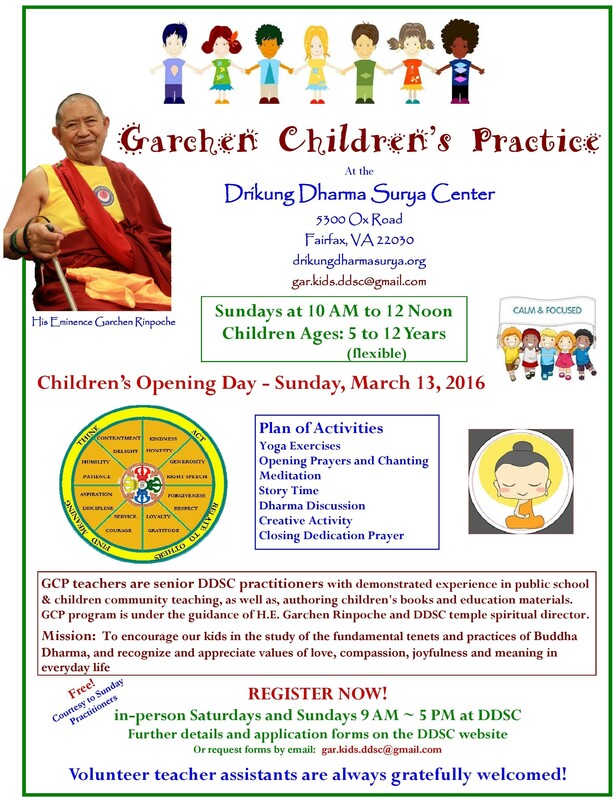 We all have heard about the Buddha, Dharma and Sangha. The outer Buddhas are infinite. They are the Buddhas of the Three Times. The outer Dharma is the words spoken by the Buddha, the teachings on karma and so on. It is the method to free from suffering. It is the path. The outer Sangha is those who have entered the path of Dharma (practice) and have found freedom from suffering, and therefore have the ability to show this path to others. These are the Three Jewels. Today, in the context of giving you refuge, I am your Sangha. Having found liberation from suffering myself through having applied the Dharma practices, I have found that it is of great benefit, and I am passing this on to you, thinking that also it will benefit you. Once we have taken refuge we should also understand the inner sources of refuge. The Three Jewels are not somewhere far away, separate from us. They are actually contained within our own mind. We must understand the connection between the Three Jewels and ourselves. This means the cause of the Three Jewels is actually present in our own mind. For example, the mind of the Buddhas is like a flower, and the mind of sentient beings is like the seed of that flower. “I take Refuge in Transcendent Awareness, the heart essence of Buddha.” Our awareness is the heart essence of Buddha. The inner Buddha is our own mindfulness. That is what we take refuge in. It is our cause of enlightenment. It is the mind that recognizes “This is an affliction.” “This is love.” “This is compassion.” It is our own discriminating awareness. In the beginning there is a wish, “I want to take refuge.” In the middle, there is an awareness that thinks, “Now I have received refuge.” In the end, there is an awareness that thinks, “Now I must observe the precepts.” This awareness in the beginning, middle and end is one continuum. It is our mindfulness. This mindfulness is our inner Buddha. If we observe refuge precepts, we observe them through mindfulness and heedfulness. This is our discriminating wisdom. It discerns between what is virtue and what is non-virtue, what is the cause of happiness and what is the cause of suffering, what to do and what not to do. The Buddha is the one who has perfected this wisdom. We also possess this, but we need to purify our mindstream. All sentient beings and all the Buddhas have the same mind. Our mind is the Buddha. This mind has the nature of water. When the water is completely pure, it is like enlightenment. And if the mind is temporarily defiled by different afflictive emotions and thoughts, then temporarily the water is dirty and one is a sentient being that suffers. But still, it has the nature of water. When we purify the mind of negative emotions and self-grasping through wisdom and compassion, the pure mind itself is the Perfection of Wisdom. That is the mind of Buddha. That mind is our own mind. That mind itself is the non-conceptual wisdom that transcends the Three Spheres (Duality of Subject, Action, Object). This also is the etymological meaning of the word Buddha (Tibetan: Sang Gye). “Sang” means to clear away. This refers to clear away grasping. “Gye” means to expand, vast. This refers to freedom that transcends the Three Spheres. “I take Refuge in Compassion, the heart essence of Dharma.” If our mind already is the Buddha, then why is it that sentient beings are not enlightened? What is the difference between sentient beings and Buddhas? If the seed does not meet with conditions, it will not sprout. This is just like sentient beings not meeting with the Dharma and wandering endlessly in the six realms of samsara. In The Thirty-Seven Bodhisattva Practices it says, “All suffering without exception comes from wishing for one’s own happiness. The perfect Buddhas arise from the altruistic mind.” It is because we give rise to a mind of self-grasping that we fall under the power of negative emotions. This leads us to wander in the six realms of samsara. The Buddha said: “Within all sentient beings is the Buddha. Sentient beings are only obscured by adventitious stains.” These stains are the stains of self-grasping. To separate from the self-grasping mind, we must cultivate the altruistic mind. When we take refuge, we must recognize the preciousness of love and compassion, and then habituate to it, continuously. If love and compassion remains in our mind, we will become free of self-grasping. Throughout the six times of day and night, we must always remember sentient beings. That is the Dharma. The outer Dharma consists of eighty-four thousand Dharma teachings. But in brief, they are included in loving kindness and compassion. The inner Dharma is love and compassion. The real Dharma that we take refuge in, the actual Dharma, is our own love and compassion. This is the supreme protection. If we do not give rise to love and compassion, then even if we take refuge, we will not really be protected. We will not become true Dharma practitioners. When with wisdom we apply the method to abandon the causes of suffering, this becomes the path. Gampopa said: “Bless me that my mind becomes the Dharma. Bless me that Dharma becomes the Path.” For the mind to become Dharma is rather easy. What is more difficult is the second. The Dharma only becomes the path if we give rise to altruistic mind. Only then we will become free of self-grasping. To practice Dharma means to let go of self-grasping. Otherwise we cannot go beyond samsara. “I take refuge in Spiritual Friends, the heart essence of Companions.” The Dharma is shown to us by Sangha, the guides on our path. If we cultivate love and compassion, then we become a Sangha. In general, Sangha has many qualities. But in brief, the qualities are love and patience. That is what makes Sangha “noble” or “superior”. Ordinary sentient beings have self-grasping. When someone hurts them, they revenge. But as Sangha, we cultivate the altruistic mind. Even if somebody hurts us, we practice patience. We protect over love. The essence of Sangha is virtuous conduct. A superior Sangha remains inseparable from an altruistic, beneficial intent towards sentient beings. You should think, “I am noble Sangha. When someone mistreats me, I will practice patience. I will protect love.” Then you are true Sangha. Then you will be able to protect yourself and others. The spiritual master actually is even more precious than our own body. In The Thirty-Seven Bodhisattva Practices it says: “Holding sublime spiritual friends even more dear than one’s own body is the Bodhisattva’s practice.” The reason for this is that whatever we learn from our teachers remains like a seed in our mind. The wisdom of what we have learned remains in our mind. We can see this sometimes in little children. For example, some children are interested in learning things and also it comes easy to them. This is a sign that they have already learned in the past. And then there are other children, even though they might have the same parents, they have no interest in learning, and also it is harder for them to learn anything. This is because in many past lives they have not learned, not studied. This is in a worldly sense. But Dharma teachers especially teach us karma, and with this they give us the freedom to accomplish happiness in the higher realms, temporarily, and ultimately to attain enlightenment. When we are introduced to the causes of happiness and suffering, we receive the freedom to create our own happiness. Thus we should remember both kinds of teachers again and again, the worldly teachers and the spiritual teachers, and think of them with love. We should see the spiritual master who gives us refuge as the embodiment of the Three Jewels. If you practice Lama Chopa, you understand how the Lama is the embodiment of the Three Jewels. The guru’s body is the Sangha. The guru’s speech is the Dharma, because it explains the words of the Buddha. The guru’s mind is the actual Buddha. Actually, everyone’s mind is the Buddha because we all have Buddha Nature. The Buddhas and sentient beings are like the mala beads on one mala string. The string is Buddha Nature. It is the union of emptiness and compassion. The enlightened mind of the Buddhas and the mind of sentient beings have a single ground. The Buddhas have perfected altruism while sentient beings grasp at a self and are afflicted, that is the only difference. Still, their nature is the same. All the Buddhas are included within the guru. Even within one Sangha, the Three Jewels are contained. In this way, I am representing the Three Jewels. My body is Sangha, my speech is Dharma, and the mind the Buddha. If you have this view, then qualities will arise in your mind. In brief, the essence of inner refuge is to cultivate love. When we die, our wealth and possessions will not help us. We have no power to carry them with us. But if we have cultivated love and compassion, it is like a seed in our mind that we will bring forth with us. It is this precious bodhicitta (love and compassion) that will be the cause of happiness in all future lives. All the Dharma is actually contained in this verse. The more elaborate version of the precepts is The Thirty-Seven Bodhisattva Practices. We have them translated in many languages. All the different traditions agree with it. Even if you don’t have the time to do any other practices, at least read the thirty-seven practices once a day, and in all your activities try to act accordingly as much as you can. Even if you were to study all the words of the Buddha, everything in those scriptures is contained in this little booklet. The essence of the Buddha’s teachings is the Two Truths. The conventional truth is the infallibility of karma, cause and effect. If we do not abandon the causes of suffering, we will not be able to abandon suffering. This means we must practice the cause of virtue, which is love, and abandon the cause of non-virtue, which is self-grasping. If we practice in this way, our mind will become purified. Then we will understand ultimate truth. “Do not commit any wrong”. Wrong is any action we do motivated by a mind of self-grasping, such as anger, hatred, and jealousy. Whatever we do with a mind of afflictions is non-virtue. It is wrong. The result will fall back upon us, just like when we throw a rock up in the sky it falls back upon us. If we experience suffering, it is due to actions we have committed in the past with a mind of self-grasping. If others seem to cause us suffering, it is because we have created the karma in the past already. That is what is coming back to us. That is why in this world there are wars, there is hunger and thirst, there is poverty, and there are those we don’t like. It is the ripening of hatred, jealousy, greed, and such. As our main commitment we should hold on to the vow, “May I not cause any harm to any sentient being with my body, speech, and mind.” This completes the individual liberation (pratimoksha) vow. “Perfectly practice virtue”. This refers to anything that we do with body, speech, or mind that is motivated by love and compassion. Whether it is worldly or Dharma practice, whatever we do with such a mind is virtuous. This is what we should practice. It is the same for virtue as it is for non-virtue: if we send benefit to others, benefit will come back to us. For example, if you have some happiness in this life, it is the result of actions you have done in the past that came from a place of love. On a conventional level, when we engage in any action, for as long as we perceive self and others, there is a corresponding result that comes back to us in return. For example, if we are generous, what will come back to us is abundance. If we steal from others, what will come back to us is poverty. If we engage in activities motivated by love and altruism, temporarily we will be born in the higher realms or in the pure lands, and ultimately we will attain enlightenment. The principal precept to observe is in The Thirty-Seven Bodhisattva Practices where it says: “To Bodhisattvas who desire the pleasures of virtue, all those who do harm are like a precious treasure. Therefore, cultivating patience devoid of hostility is the Bodhisattva’s practice.” When we perceive harm and difficulty due to others, we must never get angry with them. We can explain to them by reasoning, but we must never get angry with them. If we do not let our bodhicitta samaya degenerate, then we will be protected until we attain enlightenment. If we give way to self-grasping and afflictive emotions, it will lead to suffering in the six realms of samsara. If we understand the workings of karma, we will be able to tolerate the sufferings we experience now and also we will know how to avoid the sufferings in the future. We must cultivate a mind of love for all sentient beings because love is what really protects. It is what all sentient beings need. When we cultivate love, it becomes the most supreme offering to all the Buddhas and the greatest benefit to all sentient beings. It accomplishes the purpose of self and others. There is really nothing else that we need. We must take the vow, “I will not lose this love in a moment of anger or hatred.” All the Buddhas in the past cultivated such a vast mind of love and compassion even at peril to their own body. In our mind we should exchange self with others. This means we must put others before oneself. We should always think of love and compassion of sentient beings. In our conduct we should equalize self with others. This means whatever we do, at the very least, we should not cause any harm towards any sentient being. We should aspire, “Whatever I do with body, speech, or mind, may it become the benefit of sentient beings.” This completes the bodhisattva vow. If we have such an attitude, we will perfectly practice virtue. Then, even if we recite just one mani (Om Mani Padme Hum), it will become the benefit of sentient beings. Whatever you do with such a mind, for example, when you are eating and so on, will become an offering to the Three Jewels. “Completely tame your own mind”. The Buddha said that if we wish to be protected from suffering, we must purify the mind. All suffering has its root in our intention in the mind. The outer activities of body and speech are secondary. What is most important is that we purify the mind, and we subdue the three negative states: 1) Harmful thoughts or the wish to harm others, 2) Desirous or lustful thoughts, and 3) Ignorance or wrong view. These should be tamed. If we always cultivate love and compassion (which is the Method), if we do not cling to any other thoughts, the negative states will naturally be subdued. The afflictions will become cleansed. To thus cleanse the mind, that is the Buddha’s teaching. Once the mind is cleansed, the pure mind already is the Buddha. All sentient beings are pure on the ground. This means all sentient beings have Buddha Nature. They have the potential to attain enlightenment. You should contemplate this again and again and cultivate a pure view towards everything that appears and exists. There is no need to look for Buddha elsewhere. This completes the secret mantra vow. We should clearly understand the benefits of taking refuge and the faults of not taking refuge. The Buddha’s teachings are called the source of all benefit and happiness. When we take refuge, there is temporary benefit and ultimate happiness. We will be protected from lifetime to lifetime until we attain enlightenment. That is, if we follow the instructions of the Three Jewels. How are we really protected? When we take refuge, we are told to cultivate love and compassion. If you cultivate love and compassion, then naturally like the light rays that shines forth, you will engage in actions such as generosity, moral discipline, and patience. If you have love for others, you will be generous. Then in all future lives you will experience abundance. If you have love for others, you will not want to harm others. So you will practice moral ethics naturally. As a result you will obtain a precious human body. If you have love for others, you will practice patience. As a result, in future you will have harmonious friends, beautiful appearance, and a long life. All the benefits, all the happiness of the higher realms, come from practicing generosity, moral discipline, and patience – based on love. The seven qualities of the higher realms are only obtained through such a mind of love. The only cause of happiness is Love. As we continue to persevere in the practice of love and compassion, our self-grasping will diminish. Then, through meditation and wisdom, we will ultimately separate from self-grasping and attain enlightenment. Enlightenment means we have completely purified all grasping, all defilements and obscurations, and have no more fixation to even temporary suffering. But to accomplish this, we must practice with diligence. Without diligent practice, even if we were to memorize all the Buddha’s teachings, they would be of no benefit. It is important to engage in practice. By taking Refuge, we obtain the benefit of the Three Vehicles. “When harm to others and its cause are abandoned, the individual liberation vows are complete.” There are many different precepts, but once we take the refuge vow, from this time onwards, we should never cause any harm to others intentionally, with body, speech, or mind. When we refrain from causing harm to others, this discipline closes the door to the three lower realms. “When help to others and its cause are accomplished, the bodhisattva’s vows are complete.” When we give rise whole-heartedly to an altruistic intention seeking the benefit of others, self-grasping collapses and we achieve the state of a bodhisattva. During refuge we are introduced to karma, and the importance of protecting love – which is the essence of that. Cultivate love for sentient beings. If you cultivate and protect love, you will have fewer difficulties. Especially those you are related to and encounter, you should not get angry or jealous at them. You should care for them with compassion. “When one is adept at the pure perception of the vessel and contents, the mantric vows are complete.” The essence of tantra is pure view or pure perception. It is the essence of vajrayana practice. All sentient beings have a single ground, a single mind, called Buddha Nature, which is utterly pure at all times. All sentient beings are pure by nature. The outer universe that appears, consisting of the five elements, appears for the sake of sentient beings, to benefit sentient beings. Whatever appears and exists, the vessel and contents, the universe and sentient beings – are actually nirmanakayas. If we understand this, then no matter what appears – pure or impure – even if things appear in an impure way, we will understand that it is just like the sun obscured by clouds. Ultimately, all sentient beings have the potential to attain enlightenment. This is the secret mantra’s view. Understanding the single ground, we can transform afflictive emotions into wisdom. We can attain enlightenment in just one lifetime. This is ultimate protection. In terms of practice, when we cultivate love and compassion for others, self-grasping diminishes. As self-grasping diminishes, altruistic mind increases. As altruism increases, wisdom increases. As wisdom increases, we begin not to grasp at separate entity-ness of universe and sentient beings. We begin to realize that “self” and “others” do not exist separately – that we have a single ground. We realize that on the basis all beings have Buddha Nature. They are pure. They are like blocks of ice on the ocean, but in reality there are no real sentient beings. Then we understand that all sentient beings can attain enlightenment. When we cultivate love and compassion, we are cultivating pure perception. The refuge vow is very powerful. If we practice only one virtue, it multiplies one-hundred thousand times. For example, somebody who has not taken the vow, they might recite one-hundred thousand mani mantras, and another person who has taken the vow recites only one mani mantra. That one mani mantra is even more beneficial because of the power of the vow. Every time you wake up at night, for one moment, think of others and recite one mani mantra. Do it out of love for sentient beings. Every mani mantra you recite with such a mind of love will actually pervade the minds of all beings. If we do not receive the refuge vow, what is the harm in that? It is that we will not understand the workings of karma, and we will think that things just happen for no reason. Then, if somebody harms us, we will blame them as our enemies. We will be attached to our family and friends. We will accumulate much negative karma driven by attachment and aversion. As a result, in the future, we will experience suffering continuously. To receive refuge vow, we repeat two prayers in the witness of the Three Jewels. As you repeat, think that in the space before you are all the Buddhas and bodhisattvas gathered like clouds, and think that you are taking the vow in the presence of all the Buddhas and bodhisattvas. This is really true because the dharmakaya of the Buddha (the mind of all the Buddhas) pervades all space. Where there is space, there is the mind of all Buddhas. The sambhogakaya forms are the yidam deities who are also always there. If we supplicate to them, they will benefit us and bestow their blessings. It is just that we cannot see them with our eyes, but they are always next to us. This is because the mind of the Buddhas have great love for sentient beings. They never give up their love for sentient beings. Also later on, when you take refuge, you should think that the Buddhas are really there in the space before you. The first prayer we repeat is a commitment we take from now on for as long as we live. It is a vow that we take until we die in this life. The word “precepts” in this prayer refers to taking any of the vows related to body and speech. The second prayer we repeat is a prayer of the mind and a commitment that we take for all future lives, until attaining enlightenment. This prayer counts as a bodhisattva vow. It is an aspiration that until we attain enlightenment, we will not forsake the Three Jewels – the sources of refuge and bodhicitta – even at the cost of our life. Please repeat the second prayer and at the same time meditate on love and compassion. We must actually identify bodhicitta. We know this mind of love that we feel for our parents, our friends, our sisters, brothers, and so on. This same love, if we feel it for every sentient being, that is bodhicitta. But our love is biased. We feel it only towards our close ones, and we do not feel this love towards our enemies. It is this love that must be cultivated, that must be expanded, towards all mother sentient beings who have been our parents in previous lifetimes. We can give rise to such a mind of love for all sentient beings. What is the point of taking the bodhisattva vow? It is so that we can cultivate the cause of enlightenment. That is only Love. The bodhisattva vow is a vow of love. That means even if others harm us and are mean to us, we do not get angry at them. Normally when others love us, also we love them in return. But when others do not love us, then we do not love them. So when we take the bodhisattva vow, no matter what others do to us, we take a vow not to let this stream of love be interrupted. Even if others get angry at us or try to harm us, we do not get angry at them in return. We should practice love and patience. Love is very precious: only if we have Love, we will overcome self-grasping. And for as long as there is self-grasping and afflictive emotions, we will continue to wander in samsara. The essence of the bodhisattva vow is to not forsake love even at the cost of our life. When we take the bodhisattva vow, we are taking a vow not to lose our patience. Lord Jigten Sumgon has said that in the beginning we must cultivate love for those who hate us, those who are angry at us. If we have love for them, then there is no one that we cannot have love for. To do this, we must recognize the nature of the enemy. Why is it that enemies arise as enemies, those who are angry at us in this lifetime? It is because in a past life, this present enemy has been a very dear friend or a parent, someone who has treated us with extreme kindness, and we have failed to repay this kindness. It is really our fault that we have not repaid this kindness with love, but that we have made this other person angry. So when we first cultivate love, it is important that we cultivate love especially for those enemies who hate us, obstructers who harm us, and think that it is for their sake we are taking the bodhisattva vow. Then we engage in virtuous deeds of body, speech, and mind so that love will arise in the minds of all sentient beings. The result of these actions is a mind of love that should arise in the mind of all sentient beings. And if it arises in our mind, it will pervade all sentient beings, since the basis of our mind and all beings is one and the same. When we have rid ourselves of self-grasping and are endowed with love, we should make the aspiration that this love, this lack of self-grasping, be attained by all sentient beings. With this in mind we should recite, “May all sentient beings be happy and have the causes of happiness. May they be free from suffering and the causes of suffering.” When we say, “May they have happiness and the causes of happiness,” the cause of happiness is love. We want them to have love. When we say, “May they be free from suffering and the causes of suffering,” the cause of suffering is self-grasping. We wish for sentient beings to be free from self-grasping. If they get rid of self-grasping, they will attain enlightenment in an instant. If we practice these two vows, they will serve as the cause to attain enlightenment. On top of these, we can also take any other vows of body, speech, and mind – the four root vows of a lay practitioner, refraining from the ten non-virtues, refraining from committing the five extremely negative actions, or even just one of them. Whichever and however many we think we are able to observe, we can think these to ourselves when we take the vow. The more vows and the longer you are able to keep them, the more merit you will accumulate. We already have the Cause to attain enlightenment. This is the Method the Buddha gave us to attain enlightenment. The four root vows are, 1) To refrain from killing others intentionally, 2) To refrain from stealing others possessions, intentionally, 3) To refrain from engaging in sexual misconduct, knowingly, and 4) To refrain from divisive speech, splitting friends apart, intentionally. Between telling lies and divisive speech, it is better to avoid divisive speech. In terms of lies, there are beneficial lies and harmful lies. But sowing discord – to stir up problems between people, to tear them apart – is really the worst negative deed we can do. There is nothing that causes greater damage. It causes damage throughout many lifetimes. If we have committed this in the past, then in this lifetime we will separate from our good friends. Regarding the second prayer, Milarepa has said: “The root cause of the lower realms is anger, therefore practice patience, even at the cost of your life.” Milarepa was not afraid of anything other than his own negative emotions. Even if someone were to kill us, we should not get angry, because that would cut through the rope of liberation – which is love. If a person was to kill our precious human body and we don’t lose bodhicitta, it will stay with us. When we have given up our body for the sake of bodhicitta, that is excellent. The body itself is just an impermanent phenomena. It is like a water bubble. It is very difficult to obtain and very easy to lose. Still, it is more important to never forsake bodhicitta. There is no greater evil than hatred, and there is no greater austerity than patience. The ultimate refuge vow is to cultivate love, patience, and awareness. Especially, we need to have patience not to lose our love. Whichever vow we take, there are great merits. For example, there are some people who don’t drink alcohol or don’t smoke anyway. They might think that because they don’t do these things anyway, there is no need to take the vow. But actually it is still good to take the vow with regard to those things that you don’t do anyway. It is because if we don’t drink or smoke anyway, while we don’t have the fault of drinking or smoking, also there is no special merit from not drinking and not smoking. But if we have the vow, then we have the special benefit of also having the merit from the vow. So you can think that even though you don’t do these things anyway, you will still take the vow to avoid it. When we have a vow, we accumulate merit continuously as a power of the vow. Sometimes people say that it is good to take the vow, but then they don’t dare take the vow because they think that if they break the vow, the fault is even greater, and so it is better not to take the vow. But that is not actually true. Lord Jigten Sumgon has said that it is a greater fault not to receive the vow than to receive and break the vow. Why is this so? It is because what was explained by the Buddhas as virtue or non-virtue is just the nature of things. It is not something that is made up. Whosoever practices virtue will be happy. Whosoever practices non-virtue will suffer. It does not matter if someone takes the vow or not. Lord Jigten Sumgon has said that the essential point of virtue and non-virtue and the vows applies to all beings equally. If we take the refuge vow and we transgress the vow, we will have some recognition of this because we have taken the vow before. We will see the transgression and we will confess. In this way we will purify our negativity. Then, even if we have not purified everything and the karma ripens and we meet with suffering, still, we will meet with some rescue and we will be protected. On the other hand, if we never take the vow, we will not have the awareness of what to do and what not to do, and we will just do as we please, and will not confess. When that ripens, there is no help. We are born in the lower realms and there is nothing we can do about it. We will experience suffering for as long as we have negative emotions. Our negative emotions is like oil and our negative karma is like a lamp. Until the oil is exhausted, the lamp will burn. But even if we spend thousands of lifetimes in the lower realms, when that karma comes to an end, Buddha Nature is still as it is. So we must observe the vows as well as we can. If it does happen that we encounter some obstacles and we break the vows of body or speech, or that our love and compassion gets defiled, then we should immediately recognize that and confess it, and remember again the preciousness of bodhicitta. If we confess these transgressions each and every day, they can easily be restored. Otherwise we will continue to fall under the power of negative emotions. The bodhisattva vow is a vow of love. If you have lost your love, you have lost the bodhisattva vow. It has become defiled. This is something only you can know for yourself. You have to look inside your own mind and see if you have lost your love or not. It is said that it is easy to lose the bodhisattva vow, but also you can easily repair it. When you have gotten angry and you have lost your love, you can confess and think, “This was not good. I shall not repeat that.” In this way it can be easily repaired. As long as the stream of love is not interrupted, you have not lost your bodhisattva vow. Regarding the tantric vows: Drikung Dharmaradza has said: “To recognize everything that appears and exists as the divine form of the deity, that is the perfection of the creation stage of secret mantra.” So the vow of vajrayana is to have pure perception of the vessel and contents. The outer appearance of the world, the vessel consisting of the five elements, in true nature is the five female Buddhas. In the mind of sentient beings, the five afflictive emotions, by nature are the five wisdoms. Within our own body and mind, the five Dhyani Buddhas, male and female, are naturally contained. All sentient beings have Buddha Nature. Therefore primordially they are the Buddha. Only temporarily they are obscured, but in fact they are completely pure. To recognize this purity is the essential vow of secret mantra. There is a text called The 100,000 Samayas of Secret Mantra, but all these really come down to just such a pure perception. Within the tantric vows, there is the Fourteen Root vows, transgressions we must refrain from. These have been translated into english. We must understand the distinction between the outer and the inner vow. For example, an outer representation of the vow is to hold the vajra and bell in our hands. Sometimes people wear rings in their right and left fingers with vajra and bell. But that is just an outer sign of what must be accomplished inside. It relates to emptiness/mindfulness and love/compassion. The vajra represents compassion and the bell represents emptiness. If we do not maintain these, then just to hold the vajra and the bell externally creates an inconvenience really. It is much more beneficial to actually hold the inner vow – to remain inseparable from the union of emptiness and compassion. The 100,000 Samayas of Secret Mantra are all contained within the three samayas of body, speech, and mind. So I am always telling you the instruction of practicing the OM AH HUM vajra recitation. This contains the samayas of body, speech, and mind. Actually, these are further contained within a single samaya of the vajra mind. The samaya of vajra body is to not have any grasping at whatever form appears, to have no dualistic fixation thinking about good or bad at whatever form one sees. To not grasp at form is the union of appearance and emptiness. The samaya of vajra speech is to not grasp at any sound one perceives. To not grasp at sound is the union of sound and emptiness. The samaya of vajra mind is to not grasp at any mental-arisings, but to recognize them as awareness. This is the inner vow of an Awareness Holder. This is the actual samaya. We need to sustain mindfulness and heedfulness. When we are free of distraction, that encompasses all the 100,000 samayas. Then, even if afflictive emotions arise, they will not rule over us. We will be able to liberate them. And this is all contained in the practice of the OM AH HUM vajra recitation. The prayers that relate to bodhisattva vow are Shantideva’s prayer ( Chapter 10, Dedication, The Way of the Bodhisattva, by Shantideva) and Samantabhadra’s Aspiration for Excellent Conduct. The prayer that relates to the samaya of vajrayana is the Kuntuzangpo prayer. When you read these prayers, you restore your samaya. Even if you can’t always read them, sometimes you should read these prayers. The practice is up to us. Even though we have the cause of enlightenment, if we do not cultivate love and compassion (the Method), we cannot attain enlightenment. We must understand that love is very precious, and that patience is the one that protects love. If we do not practice love and compassion continuously, then our mind will remain like an ice block of self-grasping. It will not melt on its own if it does not meet with sunlight. That sun is like taking refuge and cultivating love and compassion. When self-grasping melts, it melts into the vast ocean, merging with the mind of all the Buddhas. Then, our own True Nature which is the Buddha becomes revealed. This means, we attain enlightenment. Then we recognize that the entire universe and sentient beings are pure from the very beginning. Next, please come up to Rinpoche for the hair-clipping part of the ceremony. 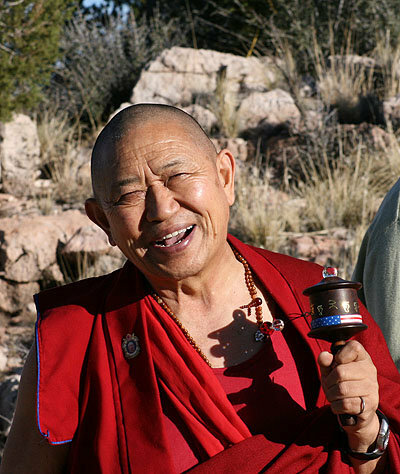 Rinpoche will take a tiny piece of your hair and put it in his pouch. This symbolizes that Rinpoche has a responsibility towards each and every one that he gives refuge from this day onward until attaining enlightenment. Concluding Remarks: Once you have taken Refuge, also you must accumulate merit. Rinpoche would like to offer you this pin with the Liberation by Seeing mantra. Many of you older disciples know about this. It is a great way to accumulate merit. When you wear this pin, you bring benefit to everyone who sees it and also to yourself. Also this red sticker with the mantra has the same benefits as the pin. Whoever sees this mantra on the sticker or the pin will purify many obscurations. It is a tremendous bodhisattva deed. Every day in the morning, remind yourself of your refuge vow and make three prostrations. Every day in the evening, again remind yourself and recall all the positive and negative actions you have done throughout the day. If you have done negative actions, confess them. And if you find that you have been pure, dedicate them for the sake of all sentient beings. I always tell my students to recite Tara (Om Tare Tuttare Ture Mama Auyr Jnana Punye Pustim Kuru Svaha) and also to spin the prayer wheel. If you really trust in the deity, you will be protected. I personally have been protected many times. Five times in my life, my life was saved as a protection of Tara – from fear of starvation, fear of weapons, fear of drowning, fear of car accident – many untimely conditions arose. If you take refuge in Tara, also she will protect you. You should trust in that. Now we have a Dharma connection to each other and we must all keep our precepts. And if we keep our precept then until we attain enlightenment, throughout all our lifetimes, we will meet again and again, we will help each other, and we will work together for sentient beings. We have a karmic connection until we attain enlightenment. Today was a short ceremony lasting a short time, but what you have accomplished is something very significant. You have received a Method to attain enlightenment. A vow is something that restrains us. What we restrain ourselves from is creating the causes of suffering and we begin to create the causes of happiness. This is the commitment you have undertaken today. I personally have experienced much suffering, much difficulty in this life. Having applied the Dharma practices, I have found that they actually are of great benefit. Understanding that these temporary sufferings were the result of my own actions driven by negative emotions, I was able to tolerate them, and in the end was able to abandon the inner causes through wisdom. And although I do not possess any other good qualities, I really have great faith and trust in the Dharma. I have gained experience in the Dharma. And this experience I am sharing with you my Dharma friends, in the form of heart advice to you. I take refuge in the Three Jewels and reveal each and every wrongdoing and non-virtuous action. I rejoice in the virtues of all wayfaring beings, and apprehend the enlightened mind of the Buddhas. In the Buddha, Dharma, and the supreme Assembly, I take refuge until attaining enlightenment. In order to accomplish the supreme two-fold purpose of others and myself, I generate bodhicitta. Having given rise to the mind of supreme enlightenment, I welcome all sentient beings. Engaging in pleasing, supreme, Bodhisattva’s conduct, may I accomplish enlightenment for the benefit of wayfaring beings. I will cause all mother sentient beings infinite as space, particularly enemies who despise me, obstructers who do harm, and those who hinder liberation and omniscience, to have happiness, be free from suffering, and swiftly attain precious, unsurpassed, perfectly complete enlightenment. For that purpose, I will apply body, speech, and mind to virtue until enlightenment is attained. Until death, I will apply body, speech and mind to virtue. From now until this time tomorrow, I will apply body, speech, and mind to virtue. Just as those gone to bliss in former times gave rise to the mind of enlightenment and maintained the progressive trainings of the bodhisattvas, in a like manner, I for the benefit of wayfaring beings, give rise to bodhicitta, and thus engage progressively in the trainings. Now whatever I do, I will engage in actions that accord with this lineage. I will act so as not to sully this flawless noble lineage. Now my life will be fruitful, having obtained well a human existence. I have today taken birth in the lineage of the Buddhas and have now become a bodhisattva. Today in the presence of all the protectors, I have called wayfaring beings to realize their enlightened potential. Until then, in order to please beings, I invite them as guests. Thus you gods, demigods and all others, rejoice. By the virtues accumulated in samsara and nirvana in the three times, and by the intrinsic virtue, may Jigten Gonpo’s intention, the body of Vajradhara, that is the inseparable union of the Two Truths in the mandala of primordial, co-emergent mind, be realized. May precious supreme bodhicitta arise in whom it has not been generated. May that which has been generated not decline but ever further increase. May the bodhisattvas practice virtue with the exalted mind, seeking the welfare of beings. May whatever the protectors wish be accomplished in sentient beings. Not lacking bodhicitta, may beings be inclined to the bodhisattva’s conduct. May I be held by the Buddha’s compassion, and may even obstructing activity be dispelled. In all my rebirths, may I never be separated from sublime gurus, and always enjoy the glory of the Dharma. Having completely perfected the qualities of the stages and paths, may I swiftly attain the state of Vajradhara. May all the aspiration prayers for the purpose of wayfaring beings that have been made, from great beneficent Vajradhara on down, to the kind root lama on up, be swiftly accomplished. Through the virtuous accumulations in the past, present and future by myself and all beings in samsara and nirvana, and through the intrinsic basis of virtue, may all sentient beings and I, swiftly attain precious, perfectly complete, enlightenment. May the teachings of the Drikungpa Ratnashri, the master of interdependent abiding, the omniscient Lord of Dharma who sees all objects of knowledge, be upheld through teaching, practice, learning, reflection and meditation, until the end of cyclic existence.